Sweet Jubilee by The Shadow measured 83.18" T2T on 5-27-14 at 2288 days of age just a little past 6years of age. Sequoia Mark is by Mile Marker and out of Win Sequoia by Winchester. 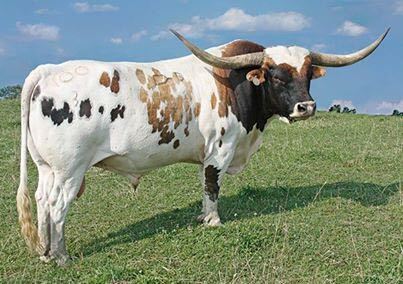 Win Sequoia is out of Shadow Sequoia the dam of Joe Sedlack's famous steer Sequoia Man with over 100" horn T2T. And, oh yeah, she is also the dam of Tibbs, soon to be 80" You will hear about Tibbs a lot this next year. Senachoo is DCC 's youngest daughter of Senator. This photo was taken 11 months ago coming out of winter. The Senator daughters had a special quality that they could stay fat during the worst winters and be the best flesh of any cows in the> whole herd. This is called easy fleshing. When one family excels above the others, all under the same conditions, mark that family and perpetuate that valuable genetic quality. If certain cows are the poorest, get rid of them. Winter will tell you about the cow herd. 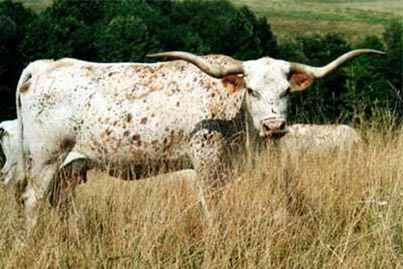 Zither introduced speckled brindle to a family of cattle that produced Jamakizm, Drag Iron, Juma, through her son Shadowizm. She is a Zhivago daughter; 7 times line bred to Texas Ranger. Everything good starts somewhere. 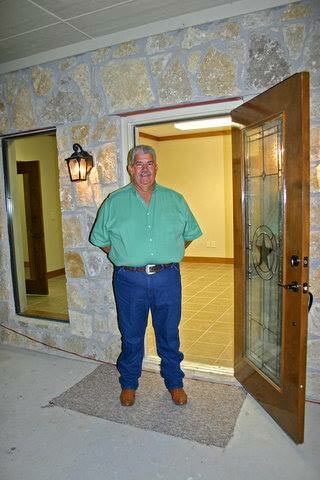 I will always be thankful to John Hodges who built the ITLA world headquarters building at no charge to the members. The cost of construction was cost of subs only. Let us not forget the great hero of the TL industry John Hodges. ITLA now has a debt free beautiful stone building to record and preserve all TL records. Thank you big John!!!!!!! Rodeo Max has lost about 150 lbs. He is in the Appalachian hills with 80 cows. He is working the pasture every hour. He is very serious about his required duties. 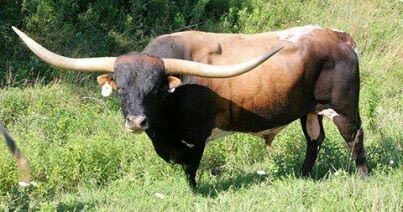 He is a great bull. Top Hand is by Top Caliber and out of a Jamakizm daughter. We were pleased with his calves from the yearling test breeding so he has a nice herd this year. He gets dark value colors, low horn and splotchy faces. 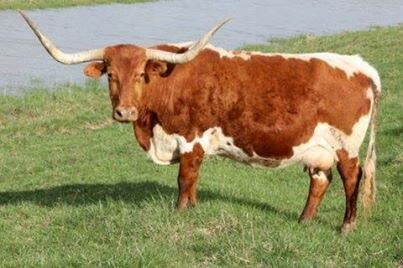 He has successfully worn off 4" on each horn due to his masculine ego, but this is not genetic. He is an out cross to our old proven bloodlines. His jury is still out, but some are winking from the box. 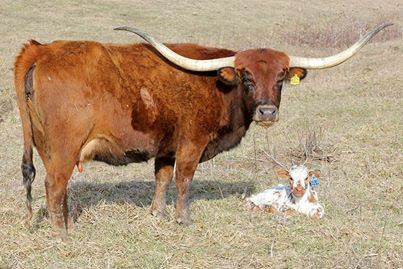 The Texas Longhorn industry is getting more serious about thicker cattle with more meat value. Yet, they do not want to let go of the huge horn and pretty color that is so pleasing on the eye. Win Win has become one of the more popular bulls to put it all together. 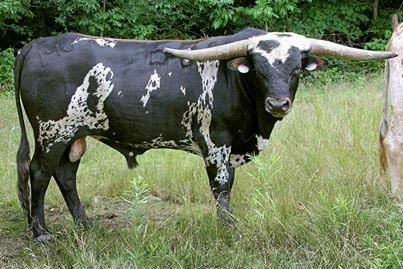 He has it all and is sire of the World Champion horn T2T Clear Win bull. 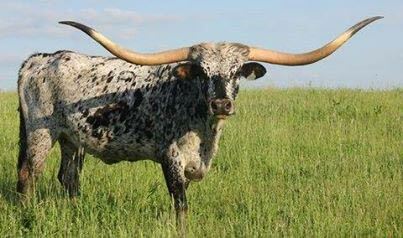 In 1986 Prof. Jan Bonsma from Pretoria, South Africa spent most of a week at the ranch in Colorado evaluating Texas Longhorn cattle. It was an honor to pick his brilliant brain. He really liked the old cows that had raised 15 to 18 calves, in fact he loved them. He sit in a chair and had us walk cattle about 100 feet straight to him. He wanted to see them at center body height. 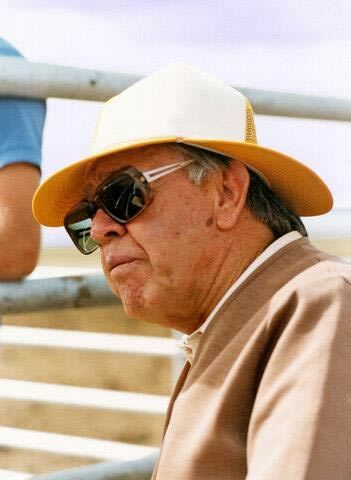 It was an honor to have him at the ranch on his last USA trip. This is my wife of 51 plus years, and 8 grand kids ago, Linda. 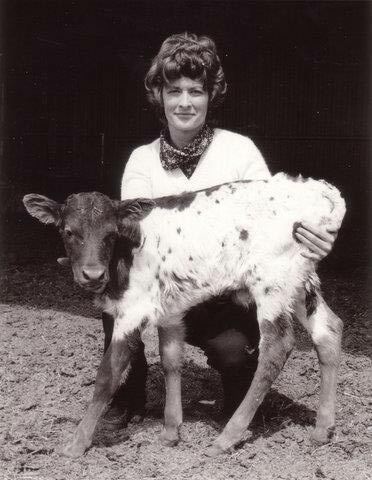 The heifer is our first embryo heifer born in 1980. Both heifers are very pretty.